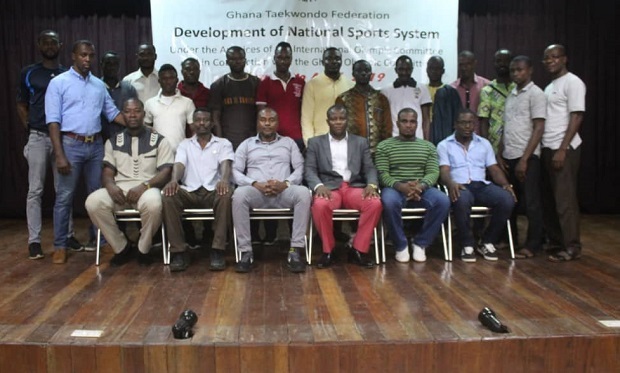 The Ghana Taekwondo Federation (GTF) has trained 20 administrators from the ten regional associations, at the Korea Sports Complex, Tema, in the second phase of the Development of National Sports System (DNSS) Program, sponsored by the International Olympic Committee (IOC), through the Ghana Olympic Committee (GOC). The five-day administrators seminar/ workshop which began on Monday offered participants the opportunity to broaden their knowledge base in administration with areas such as taekwondo administration, taekwondo events management, public relations and media, olympism, World Taekwondo Global Membership System (WT GMS) administration and the GTF communication system. Resource persons, Frederick Lartey Otu, Adnan Odartey Lamptey, and Davis Nii Attuquaye Clottey, President, Deputy Secretary General and PRO of the Federation together with Richard Akpokavie, Secretary General of the GOC who handled the various topics for the Seminar were hugely appreciated by the participants, as they were very resourceful and tactful in their lectures. The 3rd and final phase of the DNSS program, which is the 2nd National License Coaching Course for 40 is next month which will be facilitated by Ivorian and French, Patrice Remarck, a former US Taekwondo Head Coach and Olympian.